Well, we are really counting down the days this week. I find myself thinking of my ‘lasts’ quite a bit: the last time I’ll introduce myself with my maiden name, and the last time I’ll sign something with that name. I can tell you that this will not be the last time I wrap a filet mignon in bacon and fry it up for me and the Mr. This meal is just too good not to share on a special occasion. 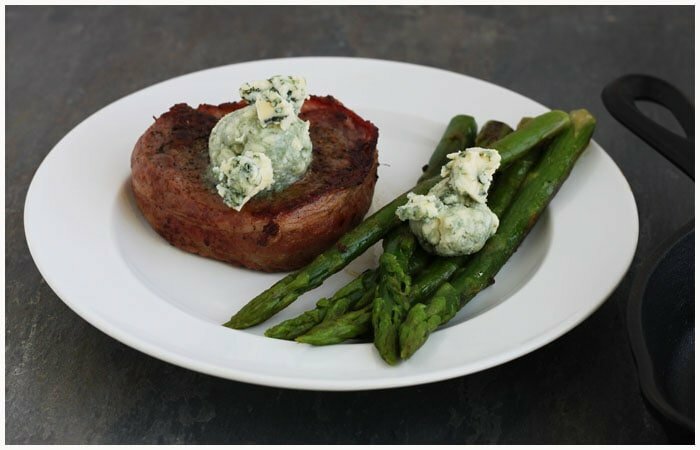 The bleu cheese butter on top perfectly melts on the hot steak, and is equally delicious on a pile of grilled asparagus. Keep this recipe in mind for your next date night–you’ll love how easy and delicious it is! 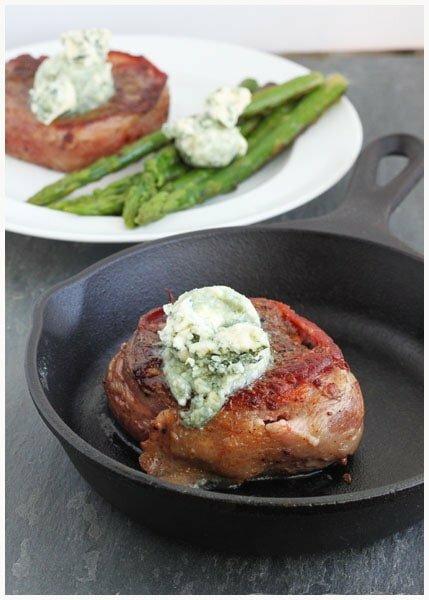 I’m sharing this recipe for Bacon Wrapped Filet with Bleu Cheese Butter over on Food Fanatic today. Looks delish! Loving the melty butter cheese. I really shouldn’t have read this while I’m still at work. All I can think about is going home and making this for dinner! No wonder he’s marrying you ;) J/K but this looks awesome!! And HUGE congrats on the wedding!!! Looks amazing! I am a total bleu cheese fanatic. I know you are going to be a gorgeous bride, wishing you and the Mr. the very best! This is my kind of meal! And if you are anything like me, you’ll keep forgetting you changed your name and introduce yourself / sign your maiden name quite often! Pretty sure my hubs would marry me up all over again if I made this for him. YUM! Well this might just be our next date night meal! Filets are our favorite! So excited for you!! and this recipe looks so stinking good! that blue cheese butter has my name written all over it! What a beautiful dinner! And what an exciting time this is for you! Enjoy every second! I am convinced! This looks great! I am SOOOO excited for your wedding! You are going to be such a fun and stunning bride! I cant wait to see all you photos and hear the run down! EEEK! So soon! You had me at blue cheese butter. NOM. Mother of all things good and holy! I love this. Nothing better! I’m, for reals, coming to your house for dinner. Love the bleu cheese butter! This looks incredible! What a great “last meal.” :) So excited for you! So excited for you, Christina! I bet it’ll feel nostaligic but so nice at the same time to introduce yourself with your new last name. Such a huge step in life and I can only imagine the butterflies you’re feeling! This dinner for two looks killer! Bleu Cheese Butter? What? Can I spread it on my toast, sandwiches, carrots, pancakes?? It looks amaaaaazing! Your man’s a lucky one to share this terrific meal with you! I’m so excited for you! I bet you can’t wait for the first time you introduce yourself by your new name too! this steak looks amazing! What a mouthwatering, elegant meal Christina! Wishing you lots of luck with everything to come, and a very happy wedding day! ohh this would make such a great date night in! Oh my! So very pretty!!!! !